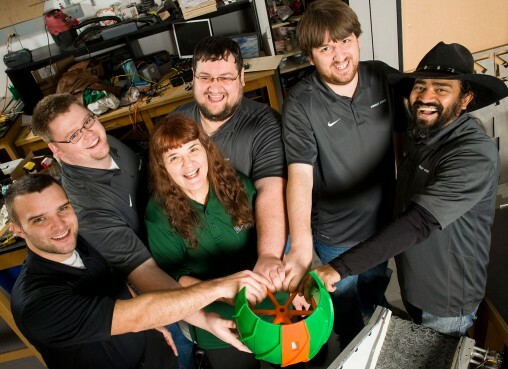 From left: the Wright State Robotics team includes Marc Potts, Ben Cook, Kathy Charpie, Andrew Young, Matthew Lents and Harsha Bulathsinghalage. The team is pictured with last year’s robot. If you travel by the volleyball courts near Hamilton Hall this spring, you may see a green-and-gold-colored robot maneuvering around scooping up sand and rocks. The robot is a product of six students in Wright State’s College of Engineering and Computer Science who will represent the university in the NASA Robotic Mining Competition at the Kennedy Space Center in Florida May 18-22. The competition challenges university students to design and build robots capable of maneuvering around a simulated Martian environment while digging, collecting and dumping soil and gravel. More than 50 colleges from around the United States, including the University of Alabama, West Virginia University and the Colorado School of Mines, will participate in the competition. NASA holds the competition to learn more about mining resources on Mars, the moon or an asteroid as a way to support humans in space and sustain future space missions. The space agency could use competitors’ technical concepts so each team must document how they built their robot so NASA can reproduce it. “We’re helping further NASA’s goal,” said Kathy Charpie, a mechanical engineering major from Fairborn. 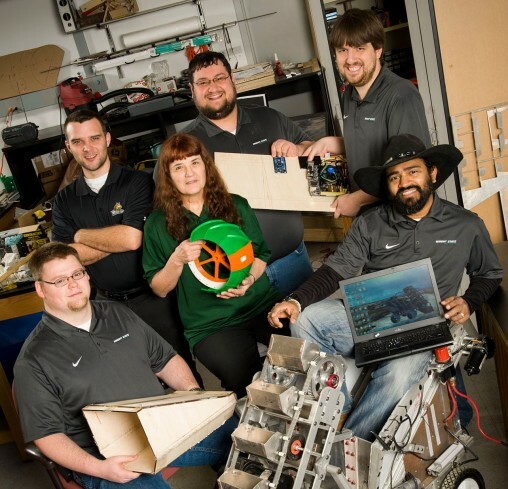 The Wright State Robotics team includes six seniors: Marc Potts, the team leader and a double major in mechanical engineering and computer engineering from Kettering; computer engineering majors Andrew Young of Sidney and Matthew Lents of Germantown; and mechanical engineering majors Harsha Bulathsinghalage of Miamisburg, Ben Cook of Kettering and Kathy Charpie. Solid model of Wright State’s robot for the NASA Robotic Mining Competition at the Kennedy Space Center. 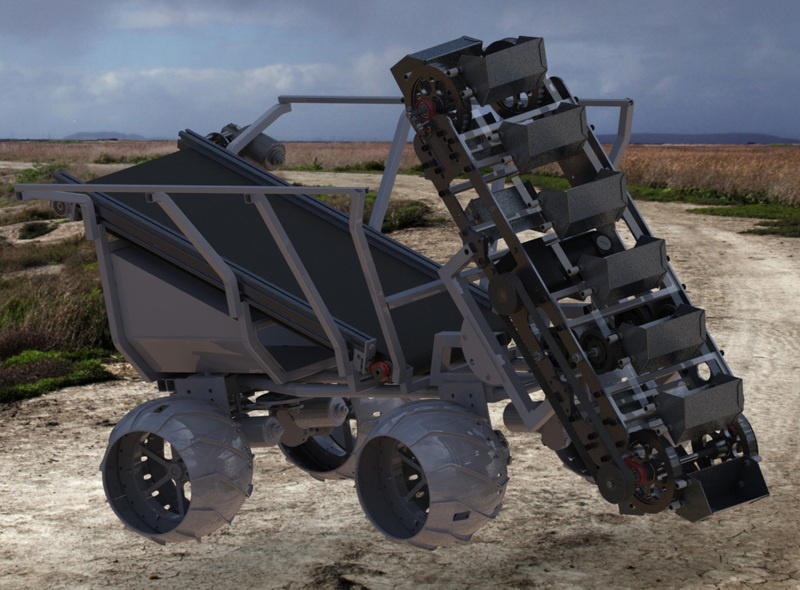 The Robotic Mining Competition will take place on a sandy field simulating the harsh terrain found on Mars. The robot must traverse the field, avoid hazards like craters, potholes and rocks, scoop up at least 22 pounds of simulated Martian dust and gravel and deposit it into a collector bin within 10 minutes. Constructed of aluminum, Wright State’s robot weighs 109 pounds and is more than 28 inches tall, almost 61 inches long and almost 30 inches wide. It uses small rotating buckets to scoop up dust and gravel and a conveyor belt to unload the materials. The team will not drive the robot during the competition. Instead, it must move around the field — and avoid obstacles — and dig and unload the gravel on its own using computer vision, machine-learning algorithms and sensors. The robotics team must overcome other challenges as they design and build their robot. The competition rules restrict the robot’s dimensions and weight as well as the kinds of sensors and electronics the team can use. For instance, they cannot use GPS or ultrasonics to help the robot move around because those technologies are not available in space. This is the sixth year NASA has held the mining competition and the second year Wright State has participated. The robotics team used 3-D printed PLA plastic parts to test and prototype a customized wheel. The wheel’s 3-D printed parts have been printed at BWI Group. This year’s team redesigned the robot, made it lighter, improved the motor and steering system, upgraded the computing system and enlarged the wheels for better traction. Bulathsinghalage said they’re trying to take the robot to next level. Team members compared the robot’s computer system to a desktop PC. It has slots to hook up a desktop monitor, USB keyboard and mouse. “You could actually Facebook on our robot if you wanted to,” Potts said. Because of the complexity of both the competition and the task of building the robot, this year’s team was strategically put together with students from multiple disciplines: mechanical engineering, computer engineering and computer science. “I think because of our team demographics we’re going to do really well and represent Wright State in a positive way,” Potts said. The team’s adviser, Scott Thomas, associate professor in the Department of Mechanical and Materials Engineering, said creating a diverse team gives the students real-world experience. Industrial projects include a mechanical engineer, an electrical engineer, a computer engineer and someone from business planning all working together. “Having that type of experience as a senior in engineering, as your senior design project, to me it’s a huge resume builder,” Thomas said. Since last September, the students have spent hundreds of hours designing and building their robot. Each team member works at least 20 hours a week on the project. Thomas said the students have worked well together and have all grown from the project. He said he was impressed the students learned on their own systems engineering, which focuses on how to design and manage complex engineering systems over their life cycles, to manage the project, as required by NASA. Thomas and the students want to make the project an ongoing one that future CECS students will work on. “We’re hoping to make this a continuing competition team, and open it up to seniors and expand to underclassmen,” Potts said. The students said it’s been exciting to have the opportunity to apply what they have learned in class to a real project. The team has received support, in-kind labor and advice from Canyon Run Engineering Technologies in Troy, GE TDI in Dayton, BWI Group in Dayton, Point Source in Germantown, the Ohio Space Grant Consortium and Nathan Klingbeil, dean of the College of Engineering and Computer Science. Gary Ward, president of Canyon Run Engineering Technologies, said his staff has enjoyed working with the team. He praised the students for their professionalism. More information on Wright State’s NASA Robotic Mining Competition team is available at cecs.wright.edu/wsrobotics. You can learn more about student-designed projects during the College of Engineering and Computer Science’s Senior Design Showcase on Friday, May 1, 2–4 p.m. in the Student Union Endeavour Room.